It’s a blustery day in late fall, and Hank decides to sneak into the back of Slim’s pickup and hitch a ride with the cowboys to a neighbor’s fall branding. 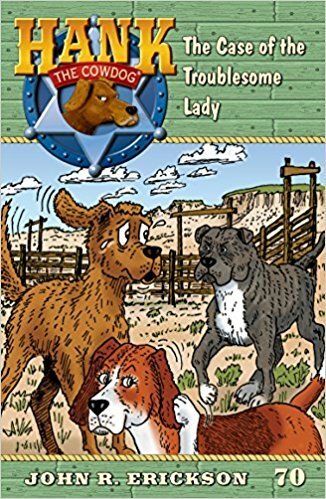 However, instead of running into either Miss Viola or the beautiful Miss Beulah the Collie, as he’d hoped, Hank finds himself on Baxter’s ranch! Things aren’t all bad though, since Baxter happens to be the very cowboy who owns the gorgeous Miss Scamper the Beagle! Unfortunately for Hank, Miss Scamper has always been a little hard to figure out, and he can’t decide if she’s crazy about him’or just plain crazy. And, as the day unfolds, it even begins to look like she’s angling to land him in a heap of trouble with her pit bull boyfriend, Steel! I love this series. I got this book right after it came out this fall and I saved it for a trip for a mindless read. These books always make me laugh and roll my eyes. I absolutely love how Erickson is able to create his characters and I can’t wait for his next book to be released.